Despite turning 70 this year, the four days in June Ojai Festival continues to be one of the freshest takes on what’s hip on the contemporary scene with an invigoratingly wide reach. The Festival hires its music directors for one-year stretches, gives them reasonable budgets, pretty much carte blanche for artists and programing, and makes good hires. This year it was Vijay Iyer, last year Peter Sellars, next year it will be Barbara Hannigan. 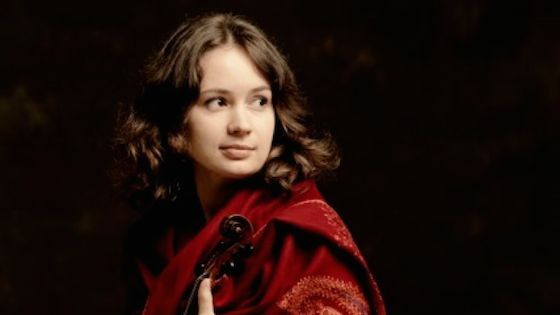 Esa-Pekka Salonen was penned in for 2018 but when he withdrew in January due to his increasing workload as a composer, violinist Patricia Kopatchinskaja, who was already scheduled for 2020, was ready, willing, and able to take over. In making her Ojai Festival debut, Kopatchinskaja won’t be alone. Also making their first appearances at the Festival will be the Berlin-based Mahler Chamber Orchestra, the New York-based JACK Quartet, composer/pianist Michael Hersch, soprano Ah Young Hong, pianists Markus Hinterhäuser (in his spare time artistic director of the Salzburg Festival) and Amy Yang, pianist/harpsichordist Anthony Romaniuk, and composer/sound designer Jorge Sanchez-Chiong. Kopatchinskaja’s parents, Viktor and Emilia Kopatchinski will also be making their debuts. And Stravinsky’s L’Histoire du Soldat will be performed on the occasion of its centennial. In addition to soloing in music by Luigi Nono, Beethoven, Tigran Mansurian, and György Ligeti, Kopatchinskaja will collaborate with Hong in György Kurtág’s riveting 50-minute long Kafka Fragments. She will jam with her parents in a celebration of Moldavian folk music and food, and present three free children’s concerts. Topping off her amazonian labors Kopatchinskaja will conceive and direct two semi-staged concerts. Dies Irae, a commentary on global warming, will use Byzantine chant and music by another virtuoso violinist, Heinrich Ignaz Franz Biber, Hersch, and Giacinto Scelsi, plus Galina Ustvolskaya’s remarkable Dies Irae for eight double basses. Bye-Bye-Beethovenwill mash up music by Charles Ives, John Cage, Haydn, Kurtág, and Bach, plus Beethoven’s remarkable Violin Concerto. Further expanding horizons the Festival is taking its show on the road to UC Berkeley’s Cal Performances series and then, for the first time, to Great Britain’s Aldeburgh Festival. When she is not keeping track of the Ojai Festival and practicing the music, Kopatchinskaja maintains an enormous concert schedule, and will soon be releasing CDs with Polina Leschenko, cellist Sol Gabetta, and with Teodor Currentzis conducting Alban Berg’s Violin Concerto. She recently recorded Hersch’s new violin concerto, and is planning a CD with Il Giardino Armonico which could be a best seller. Kopatchinskaja and I e-mailed each other for this Q&A. How much programming was in place when you took over? Nothing. Of the musicians, only the Mahler Chamber Orchestra had already been booked – and they are anyway one of my absolutely preferred partners. Tell me about the Mahler Chamber Orchestra. I know it’s 45 musicians from 20 countries who form the core of the Lucerne Festival Orchestra. In the context of US chamber orchestras like the Saint Paul Chamber Orchestra, of whom you are formally an Artistic Partner, and the Orpheus Chamber Orchestra. I never have worked with the Orpheus but often with Saint Paul and Mahler. They are not so different. Both have first class musicians and are prepared to explore frontiers of programming. The main difference concerns touring and conductors. In the Mahler the members meet and collaborate just for the projects and they do extensive tours in Europe. Saint Paul resides permanently in Saint Paul and commits to the local community in their marvelous new Ordway Concert Hall and many other venues in the neighborhood. And the Mahler Chamber Orchestra often works with conductors, while the SPCO works without conductors but with regular artistic partners. How did you get mixed up with the JACK Quartet? The JACK Quartet is an icon known to every musician. In summer 2017 I met them at the Lucerne Festival and had the privilege to play with their cellist Jay Campbell. They never have any issues about the usual questions of style, tradition, right, or wrong that normal quartets do, because they work with living composers and can just ask composers when they’re not sure. We will be never able to call Mozart or Brahms or Beethoven and be sure about their ultimate interpretation. Beethoven seems to be on everybody’s mind these days. Just last week at the University of Southern California, a daylong series of performances and discussions celebrating Pauline Oliveros took as its title Beethoven Was a Lesbian. Tell me about your Bye-Bye-Beethoven production. Well sometimes you just feel strangled by tradition if you are only allowed to play the big old monuments like Bach, Mozart Beethoven, Brahms, Tchaikovsky, Sibelius and never something else. The Bye-Bye-Beethoven project articulates this feeling. It’s not against Beethoven, who remains one of the greatest ever, but against a pervasive lack of curiosity about the present and the future. For me it’s completely absurd and unnecessary to run a career built on copying and pasting the same pieces in the same way everywhere on the planet. And what are the works in Dies Irae that people might recognize? We have the trombones of the last judgment, there are bits from Biber’s battle piece Battaglia interspersed with a selection from Crumb’s Black Angels, like God music or electric insects, and there are soldiers’ steps. The Dies Irae of Ustvolskaya is about hopelessness and facing truth. Anyway it’s not about recognizing music you may have heard before but about creating new impressions and associations, like in a dream. When you dream, you don’t analyze, you just dream. I reviewed Michael Hersch’s dark, intense Images From A Closed Ward for Gramophone magazine. What are you expecting from him? In fact Michael’s Images From A Closed Ward was the first piece we discovered from him some years ago. My husband, who has worked in a psychiatric institution, was very impressed and said that Hersch had caught the essence of a mental asylum in this piece. Then I met with Michael, I worked with him, and he wrote a violin concerto for me which we recently recorded with the outstanding International Contemporary Ensemble in New York. His music is not in the comfort zone, but it is wholly compelling. He says things in music that must be said and that nobody else says. I am a strong advocate of his music - and very glad to present a relevant US composer in Ojai. I heard Ilya Gringolts play Kurtág’s Kafka Fragments at Lockenhaus a few years ago in impossible heat; both he and the singer were drenching sweat. Even so, it held the audience transfixed for more than 50 minutes. Have you played it often before? Kafka Fragments is THE greatest song cycles of our time, after Schubert, Schumann and Schoenberg’s Pierrot Lunaire. I have played it very often and worked with Kurtág personally. When did you first play Ligeti’s Violin Concerto? That must be more than ten years ago. It is a very difficult, fascinating piece. I always imagine a child playing in his room with thousands of puzzle pieces, or a scientist in his lab, inventing new ways of old techniques, and flying into the cosmos with passengers like Bartók, Claude Vivier, Stravinsky, and Guillaume Machaut. And so many more. Please tell me more about your parents Viktoria and Emilia – Where do they live? What will they play at the Festival? My parents live near Vienna. They play Eastern European folklore. My mother plays the violin, my father plays the cymbalom – he was a star in the old Soviet Union. I always was fascinated by their music making. There was and is no line for us between our job, hobby, and private life – we all live in music, practicing, listening, talking, arguing, discovering, and dreaming about music. Like in a peasant family, where everything is centered around raising children, food, the soil and animals, so music is our harvest, our food, our garden, past, and future. It’s my sense that the soil for women and other outside groups in the classical music industry has pivoted. I’m thinking in particular about the sudden flush of young women conductors who fit perfecetly into the new freewheeling style a staid industry is trying to absorb. What are you seeing on the ground as someone who is emblematic of the change? We now discuss and realize projects which would have been unthinkable 15 years ago. In part this might be because I am more experienced now, but I really think that times have changed. Can orchestras both as institutions and as artistic entities change to a dynamic model along the lines you and groups like Brooklyn Rider implicitly propose: moving quickly and spontaneously not just as artists but as organizations? They will have to adapt or they will go the way of the dinosaurs. Small and self-administered entities like the Orpheus or the Mahler chamber orchestras have an advantage. Bigger structures often are immobilized, not even by the public but by boards, administrations, sponsors, or unions. When are you going to start conducting yourself? – There’s an increasing need for women conductors. In the last dozen years I have directed chamber orchestras as a leader, and there is very fertile soil waiting for me when I become artistic director of the Camerata Bern in 2018/19. The ideal in conducting is not to tell people what to do. It’s more about coaching and bringing out spontaneity, opening space for each participant to make fresh discoveries instead of feeling weighed down by concrete traditions. Then you get real dialogue, communication, and fun. November 8, 2017 at 04:39 PM · I saw her performance with Jay Campbell a few weeks ago at the Park Avenue Armory in NYC. It was a very moving performance for me - especially the first half. I absolutely loved it. I am grateful that there are performers like her (Anne Akiko Meyers, and Hillary Hahn) who perform modern work - and seem to enjoy playing the music. Cannot wait for Patricia to come back and challenge the audience. November 10, 2017 at 12:27 PM · Thank you for that interview. Patricia Kopatchinskaja is such an exciting artist, such a force of nature. Whatever work she plays, she makes it totally and uniquely her own.